A version of the Play Your Cards Right TV programme. Calculate the probabilities of cards being higher or lower than the one shown. a fun way to practise applying probability and using fractions. Use the buttons above to select the times table most in need of practice. Your mission is then to get the calculation over to the right side of the screen and on to the answer. Your score for completing a mission is determined by the time it takes, the quicker you get across, the more points you will score. You are awarded with a trophy for earning more than 300 points. If you bump into lightning, or lightning hits you, your mission is terminated and a new calculation appears at the left of the screen. Exercises on indefinite and definite integration of basic algebraic and trigonometric functions. So far this activity has been accessed 34 times and it is ready for you to enjoy! There is nothing wrong with having a little bit of fun while revising times table facts. 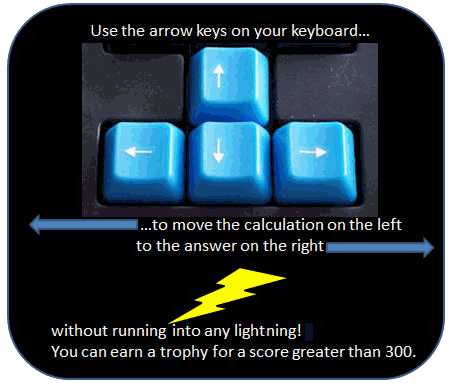 This game has been produced to keep your mind on the mathematics while you race to earn a trophy before the screen fills up with the bolts of lightning.